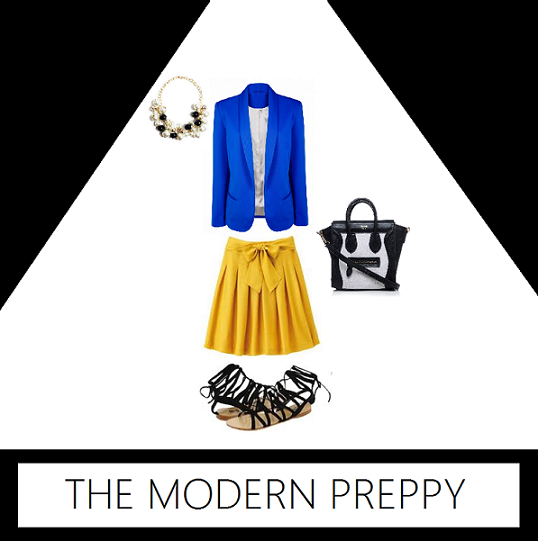 Home blazer fashion mood board olivia palermo preppy style The Stylish Bipolar STYLE BOARD: "The Modern Preppy"
STYLE BOARD: "The Modern Preppy"
Today I thought I'd do something a little different. Instead of the usual OOTD posts, I created a look by putting together images to make a complete ensemble. I figured you're all probably bored of my face by now so this way I can still show you an outfit I put together without me "modelling" it. I'm always inspired by the styles worn by young, privileged students in New York who attend expensive prep schools and spend their free time relaxing in their Hamptons home (I guess you can blame my obsession on Gossip Girl and the reality show The City). As envious as I am of their lavish lifestyles, I'm even more envious of their clothes -- they always look extremely well-dressed and polished like Olivia Palermo. Blue and yellow is a color combination you can never go wrong with. It's bright, fun, and bold, not to mention the fact that the two colors always complement each other well. Personally, I'd probably wear this blazer with yellow leggings or skinny jeans, but I chose this skirt for the style board to give the overall ensemble a more feminine and flirty feel. I also opted for gladiator sandals instead of heels to keep things laidback and effortless. What do you think of this look? Are you comfortable wearing such a bright mix of colors? I'd love to know what you think! I agree, you can never go wrong with blue and yellow. You have fantastic blog , great ootd ! I can still imagine you're the one wearing this look. :) good mix and match. Such a fabbbbulous outfit! It has such a Gossip Girl vibe! I am a salad dresser and bright colors is one of my thing! Happy New Year babe! Aw I love blue/ yellow combo! Just perfect! I think this outfit will be perfect on you! I love this look! Although I'd probably go for a slightly darker blue just so I didn't stand out so much. I really need to finish watching Gossip girl. Love your styling! I also love the Ivy style. Love this combination, Kylie! <3 Great finds! OMG! everything is on point Kylie/! kahit ano pa gawin mo either you will design/style/ or wear outfits,they always look soo good together!!! love the preppy peg here! can agree more Gossip Girl tlga ang peg!!! also Pretty Little Liars girls hehehe fan din ako ng fashion nila!